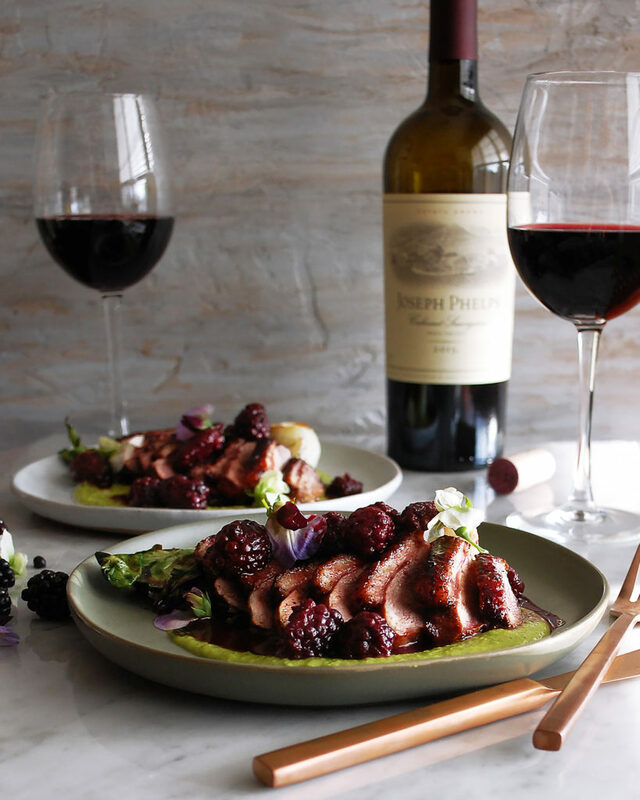 An elegant food and wine pairing that’s perfect for your next dinner party – spiced duck breast with basil pea puree & soy glazed blackberries paired with Joseph Phelps Cabernet Sauvignon. 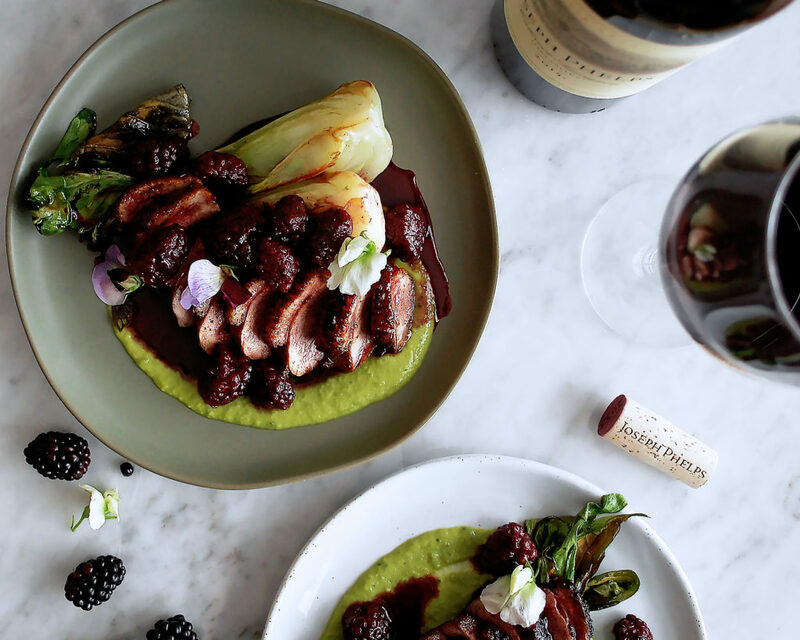 To celebrate their 2015 Cabernet Sauvignon release, I’ve teamed up with Joseph Phelps and created this mouthwatering spiced duck breast. I could not be more excited to share this pairing with you! We’ve basically got your next spring dinner party covered right here. 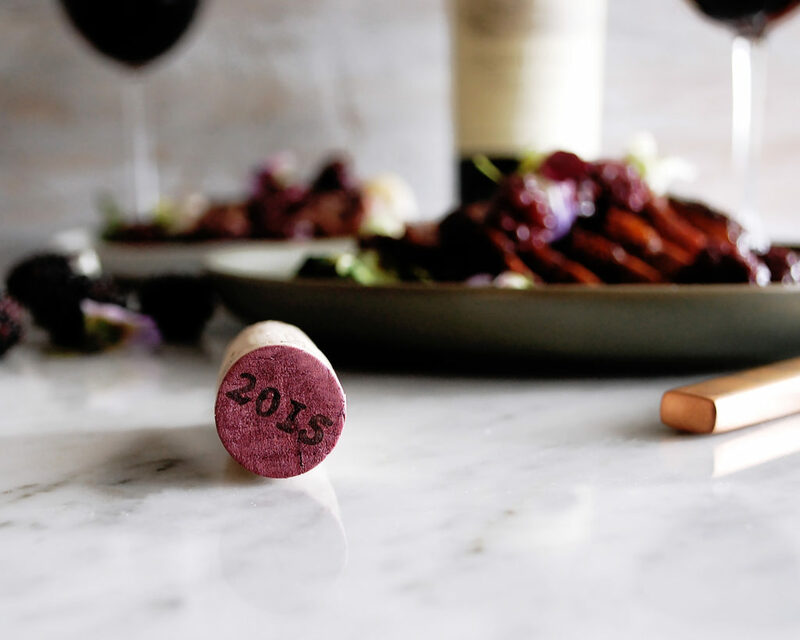 After a glance at the notes on this Cabernet Sauvignon – jam-like, aromas of dark fruit, rich, slightly sweet – I knew this would be the perfect wine to pair with food. Red wines in general make for a really nice pairing with rich meats like duck. And this wine specifically pulls out all of the complex flavor that the duck has to offer. A spice rub of smoked paprika, coriander, and cloves adds an extra layer of flavor to the duck. 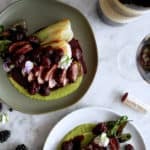 I made a “sauce” of soy glazed blackberries, which has an acidity that is a nice contrast to the richness and also highlights all of the beautiful berry and vanilla flavors in the wine. As you eat and drink, you’ll find a beautiful balance of flavors. The basil pea puree pulls the whole dish together. It’s bright, herbaceous, and turns this into such a vibrant springtime dish. I think making a seasonal puree is one of the simplest ways to elevate a dish and add that “wow” factor. I basically cooked the peas in butter and stock, then blended them with basil and cold butter to create an emulsification. The result is an extra creamy puree to spoon onto each bite of duck. Simple, yet so satisfying. Plus, even though this meal is elegant, it comes together effortlessly. You can make big batches of the puree and blackberries, keeping them warm until you serve. Then, just sear the duck breasts in large pans. You can even pop them in the oven to keep warm as you finish the rest of the meal. 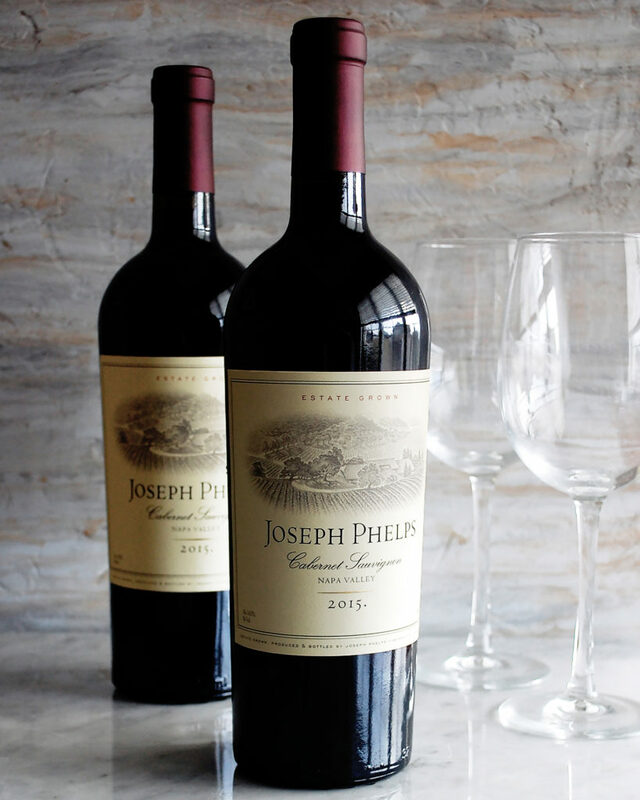 I think you and your guests will absolutely love this dish while enjoying a glass of Joseph Phelps Cabernet Sauvignon. With every bite and sip, you’ll be craving more. Pat the duck breasts dry. In a small bowl, mix together the smoked paprika, salt, ground coriander, and ground cloves. Rub the skins of the duck breasts with the spice mixture, packing in the spices and evenly coating the skin. Let the duck breasts sit at room temperature for 20 minutes. Heat a large, heavy-bottom sauté pan over medium heat. When the pan is hot, add enough oil to just coat the bottom. When the oil is hot, carefully place the duck breasts in the pan, skin-side down. Sear the skin until brown and crisp, about 5 minutes. Turn the duck breasts over and continue to cook for another 4-6 minutes, or until your desired doneness. Remove the duck from the pan, cover loosely with foil, and let rest for about 15 minutes. Over medium heat, place the bok choy in the hot duck fat and sauté until brown and tender, about 4 minutes per side. Meanwhile, melt the butter in a shallow, heavy-bottom pot over medium heat. Add the peas and sauté until tender. Pour in the chicken stock. Bring the stock to a simmer. Simmer the peas for about 6 minutes until some of the stock has reduced. Transfer the hot mixture to a food processor and add the basil. Blend until smooth for about 1 minute. Gradually add in the cold, diced butter while the food processor runs. The heat from the peas will melt the butter and allow it to emulsify into the puree. Once incorporated, season the puree with salt to taste. In a large sauté pan, melt the butter over medium heat. Add the blackberries and sauté for about 3 minutes until slightly caramelized. Stir in the soy sauce, brown sugar, water, and whole cloves. Bring the mixture to a simmer. Let cook over low heat until the sauce has reduced and thickened, about 5 minutes. Remove the cloves. After resting, slice the duck breast into thin slices. 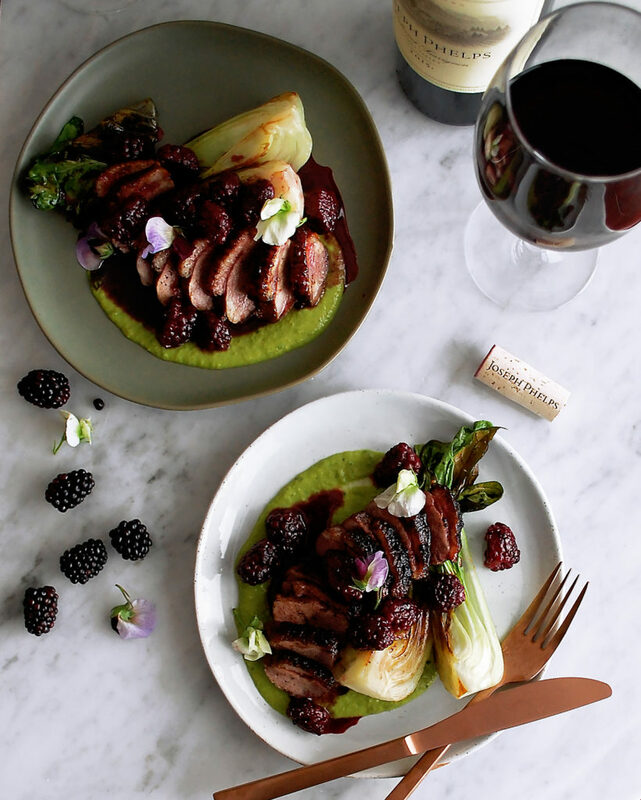 Serve the duck over the basil pea puree with the seared bok choy alongside. Spoon the soy glazed blackberries over top. Garnish with the pea flowers or shoots (optional).